This was taken a few days before we got Elsa’s diagnosis of Wolf-Hirschhorn Syndrome - an overwhelming bit of information, to say the least. Within a week of the receiving the news, my family started telling me that I needed to check out this great website, which was full of inspiring stories and amazing kids. In visiting wolfhirschhorn.org, I knew I’d be diving headfirst into the day-to-day lives of other children with WHS. At first, I wasn’t sure I could handle looking down the road… seeing what her life, our lives, might be like in 1 year, 5 years, 10 years. But after a few weeks, I worked up the courage and went to the site. And it changed my life. Instead of feeling alone on our path, I connected with dozens of other families on the exact same journey. The feeding troubles, the seizures, the heart defects, the developmental delays, the fears, the victories. When Elsa was age 2, I became more involved in the website, and today, I work alongside a few others to keep the site in motion and run exciting events to support our families. 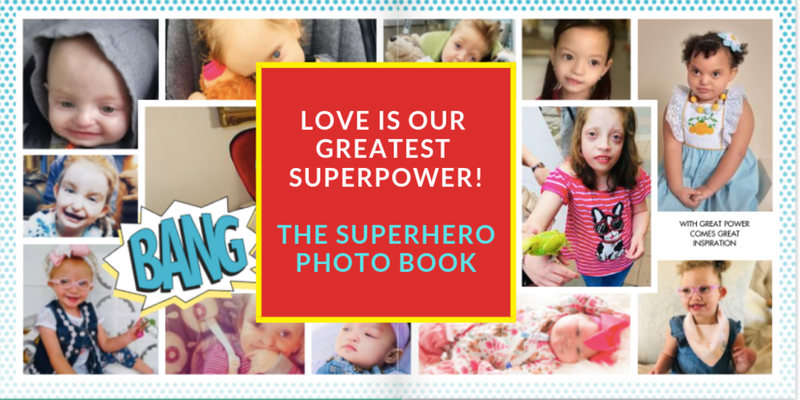 If you’d be interested in having a Superhero Photo Book, or supporting the website’s giving initiatives, you’ll find all the info HERE. Thank you for continuing to follow along and share your words of support and encouragement. We have never felt alone on this journey, which is truly remarkable and one of our lives’ great blessings.